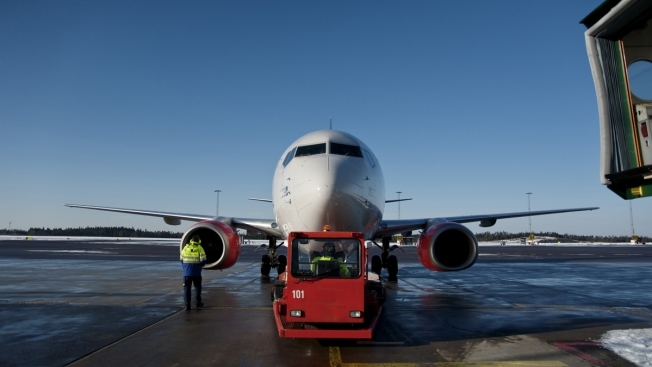 This Feb. 1, 2012, file photo shows a commercial airliner at Landvetter airport near Gothenburg, Sweden. A Swedish student activist tried to prevent the deportation of an Afghan asylum-seeker by purchasing a ticket for the flight removing him and then refusing to sit down, keeping the plane from taking off. Elin Ersson live-streamed her protest to Facebook from inside the plane that was due to fly from Sweden's second city, Goteborg, to Istanbul and then on to Kabul on Monday. Speaking in English she explained that the man was being deported to Afghanistan "where he will most likely get killed." The video was widely shared on social media and had received some 3.7 million views by Thursday morning. The man and Ersson were eventually both removed from the plane after a tense stand-off. German channel Deutsche Welle said he was taken into custody and would still face deportation, while Ersson may face legal action.